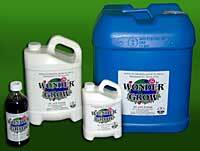 Wonder Grow is a USDA National Organics Program-approved organic fertilizer and soil amendment that can increase aerobic to anaerobic activity in the soil and enhance photosynthetic sugars. The organic fertilizer-soil amendment combines seaweed and yucca, and contains potassium, B-vitamins, trace minerals, rooting hormones and microbial activity, The multipurpose plant food can be used as a starter fertilizer, penetrant, root builder, anti-stress compound, and for mineral nutrition. Wonder Grow contains no phosphates which makes overfeeding impossible and eliminates the possibility of chemical "burns."